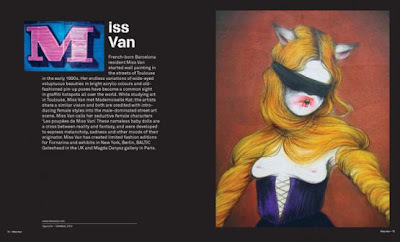 International street artists are currently conquering the art market, with auction houses, collectors and galleries demanding top prices for their work. 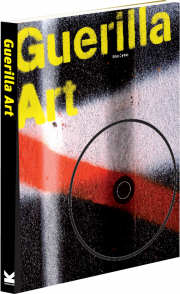 Guerilla Art is a new book by Sebastian Peiter and Goetz Werner and published by Laurence King. 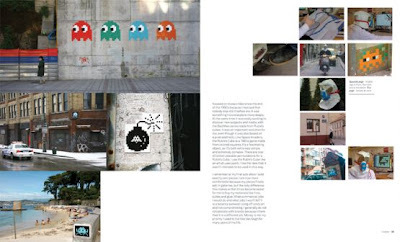 The book is packaged with a DVD and features interviews with key artists including Banksy, Futura, Ramm:ell:zee, Os Gemeos, Invader, Barnstormers, WK Interact, Zevs, Blek le Rat, Andre, Noki and Eine. Graffiti-inspired street art pioneers Futura, Ramm:ell:zee and Blek le Rat discuss their own work, how street art was born out of the days of subway train graffiti, spraypainting and tagging, and how the new movement of street artists are doing things differently. Filmed in New York, London, Paris, Sao Paulo and Tokyo, the accompanying documentary shows the artists at work: Zevs practising his 'Visual Kidnappings' of advertising billboards, Blek le Rat sticking up outsized stencils, Os Gemeos painting their lyrical, folklore-inspired murals; and Invader putting up his unique mosaic wall tile images. To mark the launch of the book Pure Evil Gallery in East London are hosting an evening of Art, film and music this Thursday 30th April. Live music from DJ Barney Doodlebug and a film screening at 18.30 and 19.30. An event not to be missed if you are in London.